Home » iRobot Roomba 650 vs 880 Comparison – Which one is your favorite? 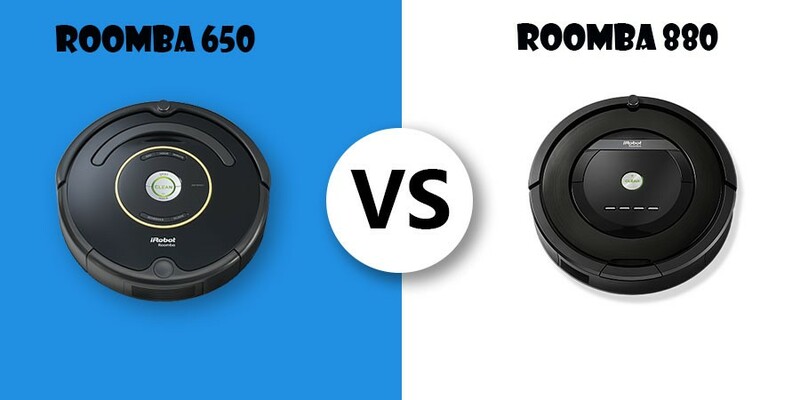 iRobot Roomba 650 vs 880 Comparison – Which one is your favorite? In this era of hectic lives, automatic floor sweepers are the future and the future is now. 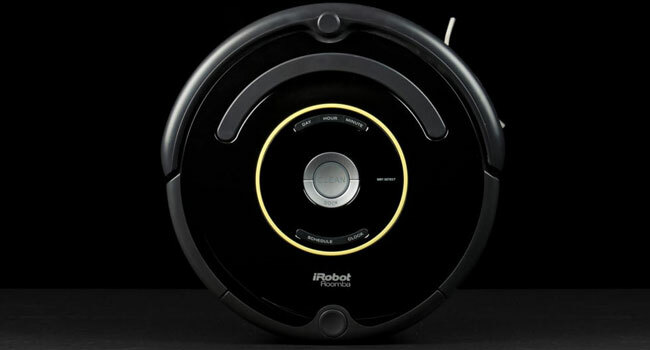 iRobot has several lines of automatic cleaning bots up its sleeve, that too at affordable prices. But among the many products in the Roomba line, which robot vacuum cleaner is best suited to YOUR cleaning needs? To help you get to the bottom of that, we will provide a Roomba 650 versus Roomba 880 comparison and review guide. By the end of this read, you will know the differences between two highly popular Roomba models of our time – Roomba 880 and 650. Let’s analyze the features and performance of Roomba 880 against Roomba 650. Later, we will view a side by side advantages and disadvantages charts for both models. iRobot programmed the three stage cleaning system in both Roomba 650 and 880. Agitate – The vacuum cleaners will agitate fixed debris to loosen them up. Suction – They will pick dirt and debris up with powerful suction. 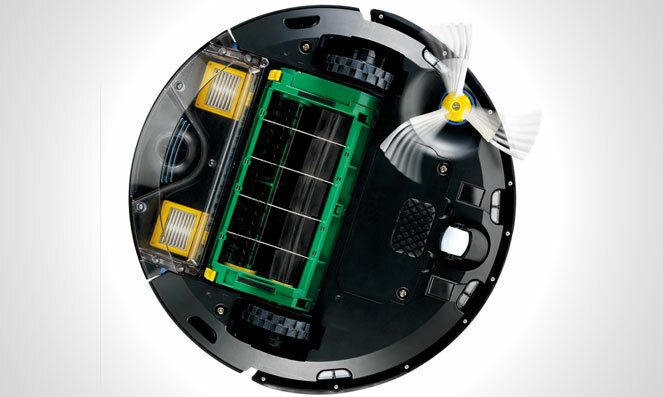 One of the most noticeable upgrades in Roomba 880 is its Tangle free technology. These cleaner heads were designed for picking up hair without entangling in them. The robot vacuum cleaner also uses new AeroForce rubberized extractors that lift and transfer dirt with more ease. Roomba 880 houses spinning side brushes that clean the bottom of the wall and corners of the floor. The acoustic sensors of both models detect messy parts of the floor. It lets your robot cleaner know which part requires more effort. But the 880 is equipped with additional sensors. 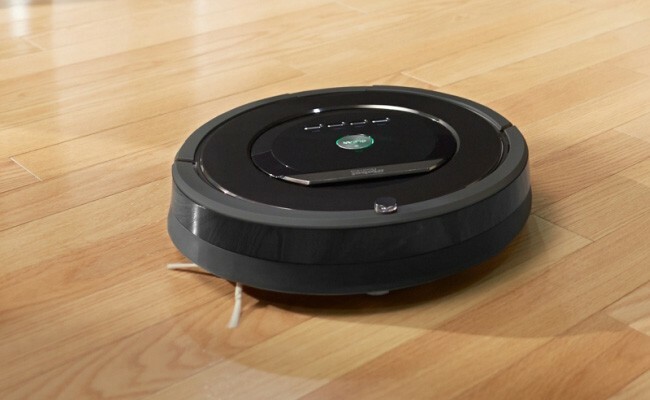 The optical sensor used in Roomba 880 identifies dirtier areas of the floor more thoroughly. Even a small patch of dust does not go unnoticed. Cleaning performance of Roomba 880 and 660 are more or less the same on different surfaces. Both vacuum cleaners demonstrate satisfactory performance on hard floors, carpets and laminates. Roomba 880 performs better on hardwood floors. It does not do well on rugs, however. It can recognize different kinds of surfaces while operating. The bot is programmed to adjust operations to the current surface. This is a feature Roomba 650 lacks. However, both of the models can adjust brush heights to match different surface levels. They both use the bumper technology to detect soft obstacles like bedding, curtains and couch. When faced with these barriers, the bots do not roam away and continue to clean under them. iRobot built a first generation motor into Roomba 650 whereas Roomba 880 got an upgraded second generation motor. To no one’s surprise, the second generation motor of the 880 generates 5 times more suction power than that of its predecessor’s. This motor teams up with the 880’s new extended life battery and provides up to 50% more performance than the 650’s configuration. This establishes that Roomba 880 has a more powerful machine. Roomba 650 uses an Aerovac filter to pull dust off the brushes and into the Aerovac bin. This supposedly removes allergens from the area of operation. Truth to be told, the Aerovac filters aren’t much compared to the dual HEPA filers which Roomba 880 uses. Its Airflow accelerator pulls dirt in from the cleaner head. The HEPA filters then trap even the finest hair, tiny particles of dirt and allergens. If you have high sensitivity to unclean air, you can benefit from a HEPA filtered vacuum cleaner. They purify the air in your house and leave it a lot healthier. Roomba 880 wins this round with little competition. Roomba 650 encloses an Aerovac bin whereas Roomba 880 houses a sealed HEPA bin. The bin capacity of the 650 is greater than that of the 880’s at 0.47 liters. The 880 is slightly behind at 0.41 liters. Both vacuum cleaners have a bin indicator to let you know when the bin needs to be emptied. The difference in the bin capacities might not seem significant to you at first glance. Yet it is. The smaller bin creates a lot of inconvenience for the 880 users because the 880 captures way more dirt. 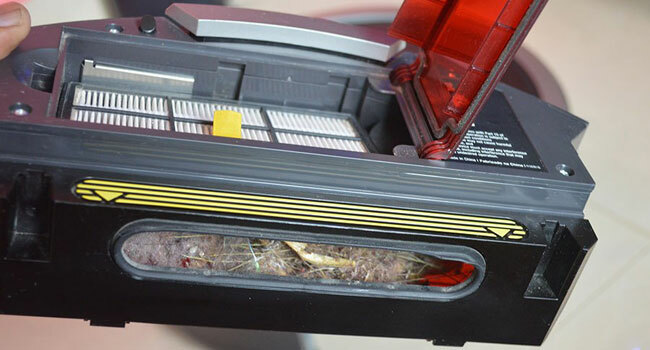 The second generation motor of Roomba 880 powerfully draws dirt in. The tangle free technology and dual HEPA filter proficiently transfer debris and fine dirt into the bin. After throwing in this powerful a configuration in a robot vacuum cleaner, iRobot should have allocated more space to the bin. Since the bin on the 880 fills up a lot quickly than expected, it will need to be emptied more frequently. The Arovac bin of Roomba 650 is a lot less hassle. Moreover, when the receptacle is full, it returns to the docking and automatically empties the bin into a central dust chamber. The 650 earns all the points in bin capacity. Both Roomba models have the iAdapt® Responsive Navigation Technology. It helps them understand the size and shape of your rooms. It ensures a thorough cleaning by having the bots clean the whole floor multiple times. Both vacuum cleaners have edge sensors to prevent them from falling off a cliff or the stairs. Roomba 880 and 650 both feature virtual walls to keep them within area limits. The Roomba 880 has an additional lighthouse mode that allows it to navigate out of a room. Roomba 650 cleans one room at a time. On the other hand, the 880 is capable of moving to other rooms when it’s done cleaning one room. The Roomba 650 dimensions are 17 x 5 x 18 inches. It weighs about 11.8 lbs. The Roomba 880 is bigger at a dimension of 20.5 x 5.5 x 16.5 inches. It weighs more too at 12.9 lbs. Both cleaners were designed to navigate under furniture for a thorough cleaning. However, as Roomba 880 is slightly shorter than the 650, it does a smoother job at sliding in under most furniture. For adjusting settings, Roomba 880 has a touchpad. If you do not feel like walking up to the bot or bending down, you can adjust the programming from a distance using the remote control. Roomba 650 lacks both of those things. To adjust its settings or to reprogram it, you have to push the buttons on top. Both Roombas can be programmed to clean at pre-scheduled times. You can schedule up to seven cleaning sessions per week. It means they can automatically clean the house even when you are not around to manually program the bots. While the touchpad and remote control rules in favor of Roomba 880, Roomba 650 has its own special features. Aside from the self-cleaning bin, the 650 features a voice prompt control which allows you to give voice commands. 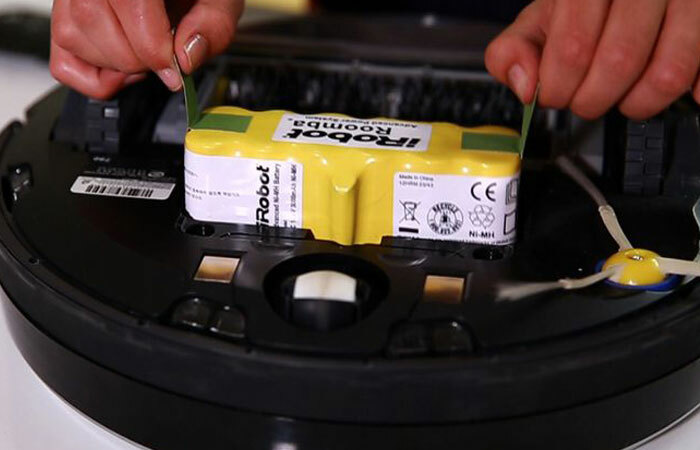 Roomba 650 is powered with a nickel-metal hydride battery. Roomba 880 is powered with a much better lithium ion battery. iRobot is calling it the XLife battery, as it extends the battery life up to twice as much compared to their previous batteries. 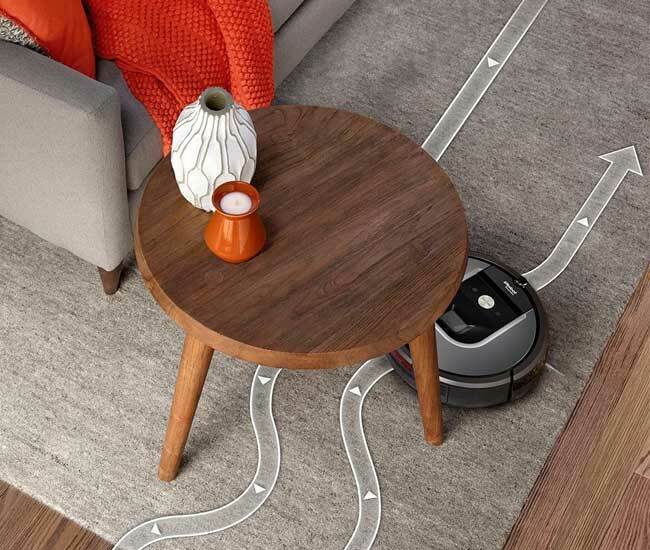 Both Roomba models come with the self-charging home base. When battery gets low mid cleaning, the Roombas will automatically return to the docking station to recharge. Which Roomba vacuum cleaner is best for YOU? If you have a larger place with multiple bedrooms and don’t mind the noise, go for Roomba 880. It is a better option for pet owners too, as the cleaning head is tangle free. If you have a smaller apartment with bare/carpeted floors and a limited budget, Roomba 650 is the better choice. Why Should I NOT Get the Roomba 650? Before we get to the review and comparison part, we will tell you right up front what isn’t the catch. If you are a pet owner and your place is filled with pet hair, you should not get the Roomba 650. The Roomba 650 targets pet owners as it picks up pet hair quickly and efficiently. But the vacuum cleaner does not have tangle free brushes. Hair tends to get stuck in the brushes. Sometimes it finds its way to the motor and clogs it up. With hair blocking the motor, the brush cannot spin smoothly. Removing hair from the brushes is an inconvenience you do not need. As it was one of the very first models made by iRobot, it has its limitations. However, Roomba 650 is a qualified cleaning bot under different circumstances. If pet hair is not an issue, read on to find out its merits. Why Should I NOT Get the Roomba 880? Roomba 880 is one of the recent models by iRobot. It has a lot of upgraded features compared to its predecessors. If we had one complaint about the Roomba 880, it would be that it produces a noticeable amount of noise while operating. You would expect a lower noise level for an automated experience. If you like your vacuum cleaners quiet, you can eliminate the Roomba 880 from your wish list. Verdict – Which Vacuum Cleaner has a Better Value for Money? Roomba 650 provides a better value for money than its way more expensive counterpart, Roomba 880. If you can spend that much on a robot vacuum cleaner, we suggest you move directly to the 900 line as it has far better features for its price. I’ve got an 880, as well as several older models (500, 600, and 700 series) that used the good old fashioned brush carriage. With the 880, the flexible duct between the “brushes” and the bin gets clogged up after almost every run. Debris tends to bridge up in that duct. My 850 will not charge. I get “charging error #5”. The chart says that is a yellow tape blocking the battery when new. Mine is 2 years old. I took the batteries out, blew away the dust and replaced. Still will not charge. Any suggestions?